Music soothes the savage beast, or in this case, bee. 2017 is going to be a banner year for video games and it started with the launch of the Nintendo Switch. It also has the launch of one of the games that people have been waiting quite some time for. The game I’m referring to is Yooka-Laylee and some people have considered this to be the “spiritual” successor to Banjo-Kazooie. The reasoning behind it being the successor is that some of the old Rare employees moved over to form Playtonic Games. The soundtrack was crafted by some of the best in the business and by best I mean David Wise and Grant Kirkhope. These guys have worked on the likes of Donkey Kong Country and Banjo-Kazooie, both games known for their creative and interesting musical numbers. Each level had great music to set the mood and Yooka-Laylee is no different. Let’s talk about the actual music in the game for a bit. The Main Theme of the game has the charm that Rare was known for and Playtonic wants to be known for. It reminds me of the Main Theme of Banjo Kazooie but not as a quick tempo-type song. Yooka-Laylee has the same feel as Banjo-Kazooie did so why wouldn’t it have similar sounding music? One of the things I liked about Banjo Kazooie was that each level had it’s own music while you were in the lobby/entry room for the level. The game gives off a charming and cute vibe so it’s nice to see levels take that the music in the other direction sometimes. What I mean by that is that it’s nice to see levels have the darker look and feel to the music such as World 3, Uphill Battle, Armed and Dangerous, and the Final Beeting. Some of these appear in the later portion of the game so why wouldn’t they give off that ominous, “you have no chance of winning” feel to them? It wouldn’t be a game created by former Rare employees without Minecart levels and Yooka-Laylee has that in spades. The music has different variations in each world but is upbeat, telling you to be quick on the controls. 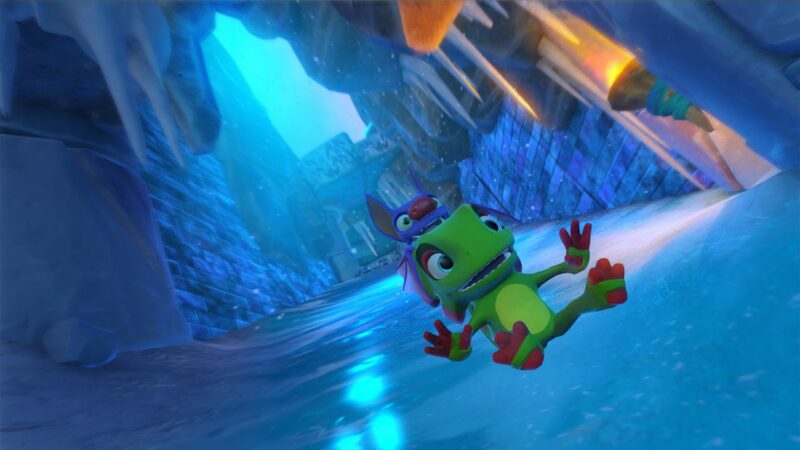 To sum up, Yooka-Laylee has a wide array of music to offer players during their adventure. It covers all avenues of music as it has quick tempo songs as well as slow tempo songs. It also sounds like the music is based off of Banjo-Kazooie and other previous works in the Playtonic Team repertoires, which is not a bad thing.